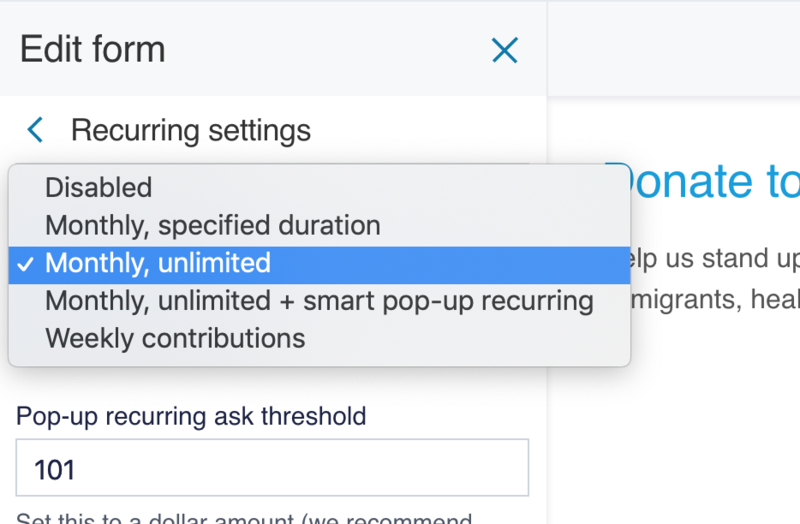 Smart Recurring will present donors with a pop-up that prompts them to commit to a smaller monthly contribution after they’ve given a one-time amount. To enable smart recurring, locate your contribution form via the Contribution Forms tab on the left side of your Dashboard and click on the “Edit” button for your form to open the contribution form editor. 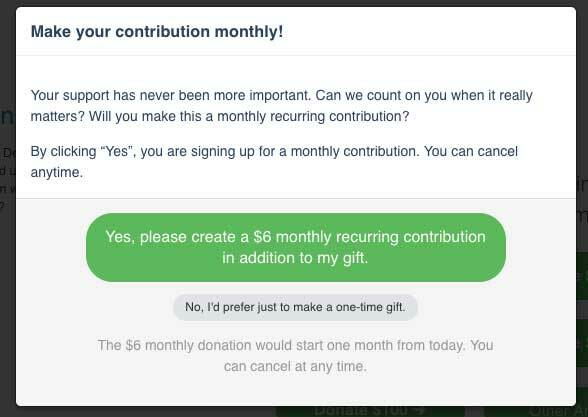 With Smart Recurring turned on, one-time contributions will process and your donors will see a pop-up similar to the one below. They’ll be asked to commit to a slightly smaller amount than they just gave every month, based on an algorithm built by our tech team.You won’t lose your one-time donation if a donor chooses to opt out of a monthly contribution. We recommend customizing your title and ask for the pop-up. Make it short and specific about why a recurring contribution will make a difference in your work. You can do so in the “Pop-up recurring title” and “Pop-up recurring ask” sections. Don’t forget to save your changes by clicking on the orange “Publish changes” button on the bottom of the form editor. If a donor makes a one-time contribution of $210 or more they won’t be asked to make a recurring contribution of any amount on top of their initial contribution, since their one-time amount is on the higher end. You wouldn’t want to ask a donor making a $400 contribution to also commit to a recurring contribution. And if someone does choose to commit to a monthly contribution using smart recurring, they’ll receive a receipt with the details of the contribution, letting them know that a charge will be processed each month. 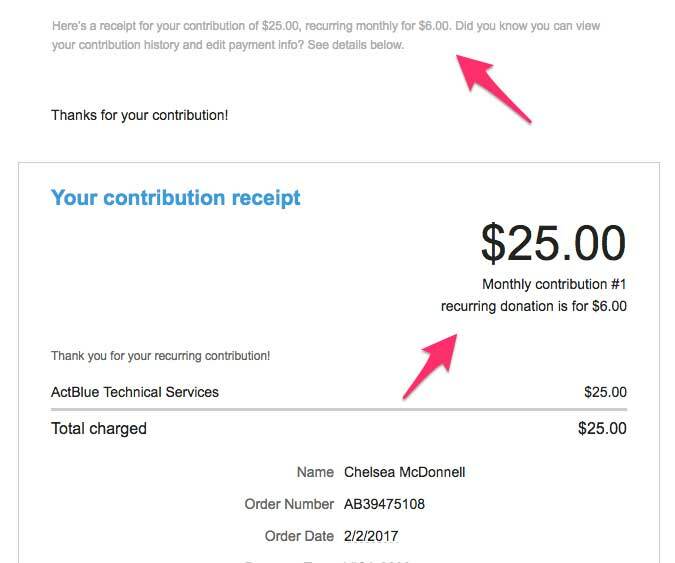 They will also see a note indicating that the contribution will recur when visiting their contribution history. 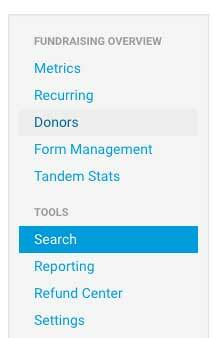 Your campaign or organization will be able to see who contributed via Smart Recurring in the detailed contribution list you can find on each contribution form’s Statistics page, or when searching for a specific contribution using the Search feature in your Dashboard. You’ll see a note that the contribution will recur each month, along with the one-time contribution amount. It will also be noted in CSV data when you download contribution info from the “Reporting” section of your Dashboard. There will be a column on the CSV specifying whether or not the contribution was made via Smart Recurring, and a separate column noting the amount the contribution will recur for.